Is there a better alternative to The Hit List? Is The Hit List really the best app in Applications category? Will The Hit List work good on macOS 10.13.4? 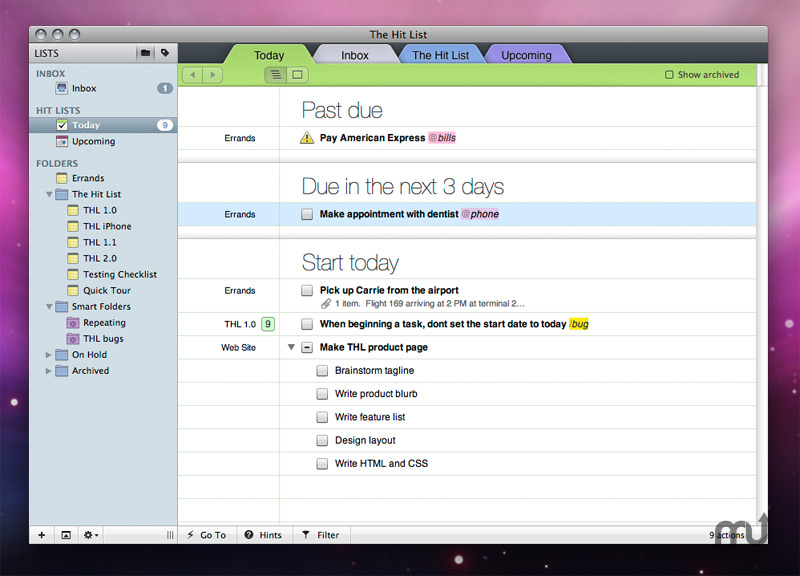 The Hit List manages the daily chaos of your modern life. It's easy to learn - it's as easy as making lists. And it's powerful enough to let you plan, then forget, then act when the time is right. Your life is complicated enough as it is. The tool to manage your life shouldn't be. The Hit List keeps things simple by not forcing you to learn a system. It can be as simple as just keeping a list of things to do as you would on a piece of paper. However, if you do have a task management system such as Getting Things Done by David Allen, The Hit List is flexible enough to support you. Forget what you need to do--with confidence.